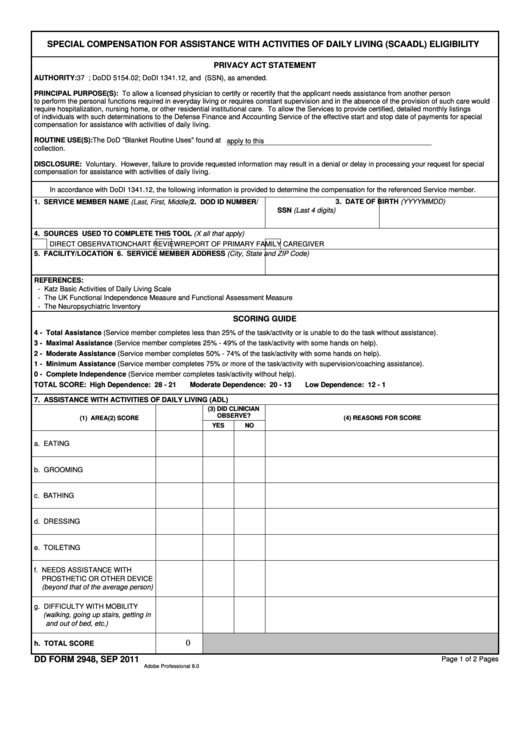 Download a blank fillable Dd Form 2948 - Special Compensation For Assistance With Activities Of Daily Living (Scaadl) Eligibility - 2011 in PDF format just by clicking the "DOWNLOAD PDF" button. Complete Dd Form 2948 - Special Compensation For Assistance With Activities Of Daily Living (Scaadl) Eligibility - 2011 with your personal data - all interactive fields are highlighted in places where you should type, access drop-down lists or select multiple-choice options. AUTHORITY: 37 U.S.C. Section 439; DoDD 5154.02; DoDI 1341.12, and E.O. 9397 (SSN), as amended. compensation for assistance with activities of daily living. In accordance with DoDI 1341.12, the following information is provided to determine the compensation for the referenced Service member. 4 - Total Assistance (Service member completes less than 25% of the task/activity or is unable to do the task without assistance). 3 - Maximal Assistance (Service member completes 25% - 49% of the task/activity with some hands on help). 2 - Moderate Assistance (Service member completes 50% - 74% of the task/activity with some hands on help). 1 - Minimum Assistance (Service member completes 75% or more of the task/activity with supervision/coaching assistance). 0 - Complete Independence (Service member completes task/activity without help).